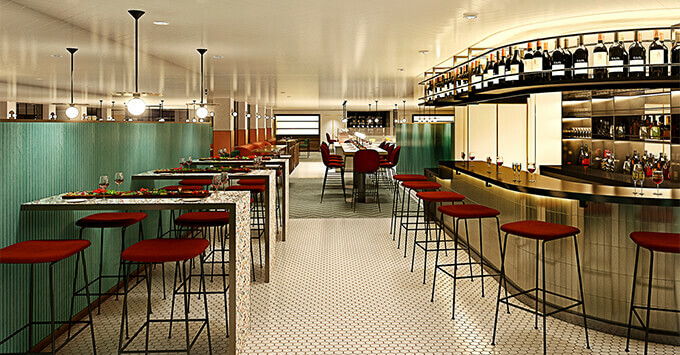 (7:30 p.m. EST) -- Virgin Voyages' Scarlet Lady cruise ship will feature more than 20 food venues when it launches in 2020. Not one will cost extra, and all will be open until late. "We want our eateries to delight and ignite serendipitous experiences for our sailors, so we have set out on a mission to capture the spirit of dining in the best cities of the world and bring it to sea," said Tom McAlpin, president and CEO of Virgin Voyages. "Because food is the fuel for our bodies and souls, and we're Virgin Voyages, naturally it all had to be included within your ticket price." As previously announced, Scarlet Lady will have no main dining room, no set dining times, no dress code and no buffet. "There's a Virgin twist on everything you'll see aboard the Scarlet Lady, which means there will be no stuffy formalities, boring buffets and no main dining rooms" added Sir Richard Branson, founder of the Virgin Group. "Sailors are not going to want to leave our ship after they experience how we've designed our restaurants and tasted the dishes we are going to be serving up in 2020." What Scarlet Lady will have is a selection of eateries that range from experimental and haute cuisine to healthy quick-bite options. In most venues, diners will have the option to eat at a table or enjoy their meal at the bar. 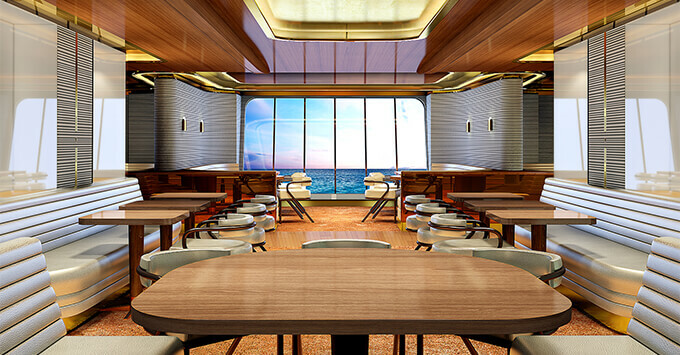 Wake: The largest dining venue onboard, the 5,866-squre-foot restaurant will be the most glamorous on the ship. Wake will be located at the back of the ship, offering beautiful views of the ship's wake. Its most dramatic design element -- a grand staircase -- was inspired by two iconic city restaurants -- The Wolseley in London and The Grill in New York City. Wake's offerings will include a raw bar, land and sea classics, a tableside cocktail cart and a Sommelier-led wine program. Razzle Dazzle: Razzle Dazzle gets its name and design from the practice of camouflaging ships during World Wars I and II using patterns of black and white paint. On the menu is a selection of vegetarian and vegan fare, as well as a juice bar. To cater to different tastes, diners have the option to add-on a variety of meats or spike their smoothies with alcohol. But food's not the only thing on the menu at Razzle Dazzle; diners will be treated to a performance by Scarlet Lady's resident drag performer and friends. For an extra fee, diners can opt to enjoy bottomless drag-inspired cocktails. Geonbae: Meaning "cheers" or "bottoms up" in Korean, this Korean BBQ restaurant is as much an interactive game experience as it is a dining venue. Participants can cook their own meal on flameless grills built into the table. Additionally, each meal will begin with a complimentary round of soju (a type of distilled alcohol), and throughout the evening, people will be encouraged to participate in lively Korean drinking games. Extra Virgin: What's a cruise ship without an Italian restaurant? On Scarlet Lady, you'll find Extra Virgin, a trattoria-inspired venue serving regional dishes and handmade pasta made daily. Also on the menu will be a variety of Amari, digestive and other traditional Italian aperitifs designed to stimulate the appetite. The wine menu will feature an infographic to help diners better understand Italian wine and pick out the right option for them. Extra Virgin will also offer an Aperitivo hour each day with drink specials and small plates. Dock: Set in the ship's lounging area at the back of Deck 7, the Dock is a place to hang out day and night. Boasting a beach club design, cruisers will find carts of Mediterranean small plates, salads, dips and mezzes throughout the day. Flame grilled-to-order skewers also will be available for those wanting something more substantial to eat. The Galley: Modeled after the popular food halls you'll find in many cities, The Galley will be the main place to grab a quick, casual meal throughout the day. The space will feature a mix of more than eight shops and food carts, each offering a unique selection of signature dishes that changes to suit the time of day. Among the options that will be on offer are a dedicated bakery and pastry shop, a panini shop, a burger grill, a taco shack, a sushi bar with bento boxes, a noodle bar, a soup and salad stand, and a 24-hour American-style diner. Pizza Place: Pizza lovers will be able to choose off the classic menu at this spot, where pies are always made fresh, or design their own based on a variety of ingredients. 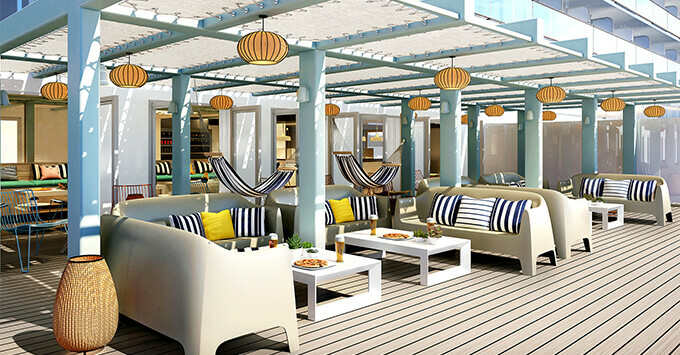 The casual spot will have a beach club-inspired design with white and pastel colored furniture, as well as hammocks for lounging. 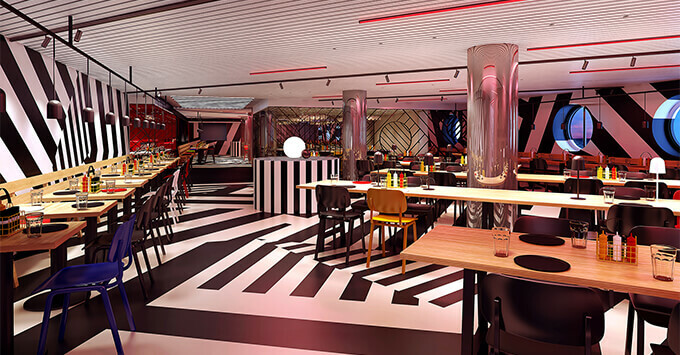 Virgin Voyages worked with AvroKO Hospitality Group, AvroKO's strategy arm Brand Bureau (BB), and its own Michelin-starred chef Brad Farmerie to help curate the line's food concepts and strategy. Some of AvroKo Hospitality Group's restaurants include Saxon + Parole, Genuine Liquorette and Ghost Donkey, all in New York City. Scarlet Lady is scheduled for delivery in 2020. It will be adults-only (18 and older), sail from Miami and feature a "vitamin sea" concept, which focuses on passenger wellness, relaxation and fun. Public spaces will include a tattoo studio, outdoor fitness center and extensive spa facilities. Virgin Voyages recently announced that select Scarlet Lady itineraries will include an overnight port of call in Havana, Cuba.